If your order weighs less than 13 ounces, save huge on shipping with USPS first class (with tracking number). This product weighs 2.9 oz. A member of the sunflower family and better known as a stubborn weed that flourishes in yards across North America, dandelion is one of the most nutrient-rich plants in herbology. Dandelion, with etymological roots in the French dents de lion, or “teeth of the lion,” cultivates the health of both the digestive system and the liver. 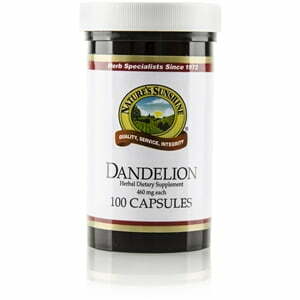 Each part of the plant, the flowers, leaves, and roots, is filled with essential minerals and vitamins. 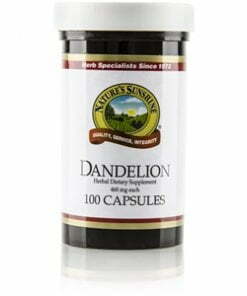 Nature’s Sunshine Dandelion comes in 460 mg capsules. Instructions: Take two capsules with a meal twice daily. Magnesium stearate (vegetable), silicon dioxide (powdered silica), kosher gelatin, and water.